Old Smokey has been a tried and true name in outdoor cooking appliances for decades. They are proudly made in the United States with American source materials. Almost every grill and smoker in their line is made from a special aluminized steel. This manufacturing process involves dipping the steel body of the grill or smoker into molten aluminum. The end result is a housing that has the heat retention of steel, with the corrosion and rust resistance of aluminum. The Old Smokey Electric OSES Smoker is one of the tallest units in their line, measuring in at just over 29-inches in height. As the name implies its primary heat source is an electric element in the bottom of the smoker. It plugs into a standard electric outlet. The heat setting is variable and can go as low as 200 and as high as 300 degrees Fahrenheit. Above the electric heating element, there is a wood chip tray, to add smoke to the equation. There is also a water/drippings pan that adds steam to the internal cooking chamber, while also limiting the volume of drippings that render out of the meat. The top is also flat, and seals tightly to trap moisture, and drip condensation back down to essentially baste the meat. The aluminized steel is somewhat unique in the industry. However, there is no formal insulation or double walled characteristics to the primary smoking chamber. This means that over the course of a long smoking session the exterior can get very hot. To the point where it could be a potential safety issue if there are children or curious pets around. The electric heating component is a classic electric resistor. It impedes current passing through it which produces heat. Unfortunately, all electric resistors have a finite lifespan. In the case of the Old Smokey OSES the electric element seems to be able to last about five years. At that point, you will likely notice the electric breaker in your fuse box tripping. The Old Smokey Electric OSES is very easy to assemble. From unboxing to loading it up for the first time should take you less than half an hour. It’s important to note that Old Smokey advises you to break in the electric smoker before using it. This involves plugging the cord into a standard electric outlet and turning the heat control to high with the lid open. After 10 minutes you should put the lid on and seal it tightly. Then wait for 10 – 15 minutes, with the open the lid to let the smoke out. You need to repeat this process three more times to completely burn off the protective oils, leftover from the factory. At that point, you should let it cool down completely, before starting a first test session. This involves putting 3 wood chips into the chip tray. Place something like a chicken leg, or a tough cut of beef, and smoke it for 30 minutes. This should complete the break-in process. 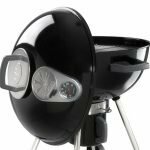 The Old Smokey Electric isn’t technically intended to “Grill” but it can do a lot of the things you get with an exposed element electric grill. It’s not necessarily going to create a great crust on a steak, but it will cook chicken thighs at high heat while imparting a lovely smoky aroma. As the name implies the Old Smokey Electric is meant to be used as a smoker. 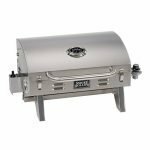 It comes with two stainless steel grill grates which can handle a decent amount of meat. You simply load wood chips into the chip tray, pour a little water into the drippings pan, and then load the racks with meat. Thicker cuts and bone-in meats should be placed lower than lean, or boneless cuts of meat. One potential foible in the design of the Old Smokey Electric is the lack of a wood chip access door. Reloading the wood chip tray requires you to pull out the meat to reach down in. One way to reduce this problem for long smoking sessions is to use wood chunks that have been soaked in water overnight. This will produce smoke, without massive flare-ups, yet last up to twice as long as wood chips. Each of the Old Smokey’s stainless steel grill grates provide 240.5 square inches, for a grand total of 481 square inches of cooking space. This is enough to smoke a single small or trimmed down brisket flat on each rack. Two pork shoulders, or up to four, halved chickens can fit. If you want to smoke multiple racks of spare or beef ribs, you can maximize the volume by cutting them down into three to four rib portions. If you want to smoke ring or linked sausage, you can use butchers twine to carefully tie them to the top rack. The Old Smokey Electric takes a little bit of effort to clean. You need to safely dispose of the ashes. The drippings pan needs to be poured out and thoroughly washed. The grill grates tend to be a little bit on the sticky side. They will need to be scraped down with a wire-bristled grill brush and then wipes clean. You might be able to reduce sticking by lightly greasing them with cooking oil before you initially place the meat. The sides of the smoking chamber will benefit from the occasional wipe down to remove residue. This includes wiping off the temperature controls and any meat probes. The Old Smokey Electric Smoker comes with a one-year limited warranty. There are also some online retailers who offer affordable protection plans. 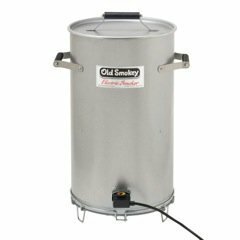 The Old Smokey Electric is a classic smoker that has undergone very little change over the decades since it’s inception. It’s a no-frills smoker that is designed to get the job done right. Just bear in mind that the electric element will only have around a five-year lifespan with regular use.